In 1909, Oxford University Press published the Scofield Reference Bible. Edited by Civil War veteran Cyrus Ingerson Scofield (a Confederate soldier), the Bible featured notes at the bottom of almost every page that helped it become two things in American history: (1) It is likely the best-selling book in the history of Oxford University Press. (2) It also introduced millions of readers to the concept of a ‘second coming’ premillennial rapture. It’s difficult to estimate just how vital the Scofield Reference Bible was in shaping the ‘end times’ views of the nation. According to Matthew Avery Sutton, “Nothing published since has matched its impact on the movement.” (American Apocalypse, 27) Interestingly, Scofield himself was not prone to mix his patriotism with his faith. However, his lasting legacy helped steer the newly unified country in a direction that would fuse their love of country with their love of God. Scofield’s Bible made its debut around the same time that another book was being introduced to the American public: William E. Blackstone’s Jesus is Coming. (1908) The wealthy Chicago real estate developer and friend of evangelist Dwight L. Moody viewed the political and economic climate of the early twentieth century as a sure sign of the approaching apocalypse. “We believe,” he wrote, “if we can rightly read the signs of the times, that the godless, lawless trio of communism, socialism and nihilism” are “preparing the way for the Antichrist.” (2nd ed., 99) Impending doom was near. And Blackstone was calling for action. The seeds of Christian patriotism were being sown by a man who is remembered as one of the fathers of “American Zionism.” According to Blackstone and men like Irishman John Nelson Darby, a second coming could not occur without a major Jewish migration back to their homeland in Israel. The “Blackstone Memorial” was a piece of legislation designed to do exactly that. But the publication of Jesus is Coming likewise signaled two things in American history: (1) the beginning of a radical new religious movement that would transform the faith of millions (2) and the return of an apocalyptic belief system known as ‘millennialism’ that placed American politics and culture in the driver’s seat to the return of Christ. By the time of his death in 1935, Blackstone had sold over a million copies of Jesus is Coming in forty-eight languages, crowning it as one of the most influential books of the twentieth century. With the advent of World War I, ‘second coming’ fundamentalists were consistently charged with being unpatriotic. More often than not, apocalyptic Christians were hesitant to join any kind of international conflict when their faith in ultimate victory was zero. Why meddle in the affairs of an evil world doomed to destruction? As a result, conservative Christians were often accused of being antidemocratic. University of Chicago’s Shirley Jackson Case exemplified the liberal anger against fundamentalists when she wrote that premillennialists “were advocating a type of teaching which is fundamentally anatagonistic to our present national ideal.” After all, men like Darby (the father of Dispensationalism) and Scofield had emphasized the apparent contradiction between apocalypticism and nationalism. To the modern American, this is unthinkable. Today most conservative Christians who believe in the ‘second coming’ rapture are those who support our nation’s military and its causes overseas. They’re the ones delivering accusations of disloyalty, not receiving them. Why is that? What happened in American history that turned premillennialist evangelicals from Democratic isolationists to pro-war Republicans? The answer is two world wars and a Great Depression. After defeating the Kaiser in World War I, American exceptionalism was birthed in a nation that had succeeded in conquering evil. But whereas ‘second coming’ fundamentalists (premillennialists) held a deep-seeded suspicion of big corporate greed before World War I, after the war that sentiment changed to suspicion of organized labor. With Bolshevik communists and immigrants unionizing, American fundamentalists developed a sense of patriotism that rallied around individualistic work ethic. Once the Stock Market crashed in 1929, labor politics divided much of America. And while many modern Christians may view FDR through a rose-colored lens in 2015, it’s important to remember that such was not the case in the 1930s. FDR’s disdain for Prohibition along with his ‘communist’ labor policies in the New Deal forced many ‘second coming’ evangelicals to turn to the Republican ‘trickle down’ economic policies of Hoover. It was their belief that the more federal government assistance they received, the fewer rights they actually retained. However in 1932 Roosevelt defeated the incumbent. And he would stay in office longer than any American President. In 1935 J. Gresham Machen (founder of Westminster Theological Seminary) wrote to President Roosevelt, calling the Social Security Act “inimical to (1) liberty and (2) honesty.” Evangelicals/Fundamentalists had aligned themselves on the side of independence, and that meant the GOP. FDR’s centralization of power and seemingly socialist policies were repugnant to now-Republican evangelicals. Despite angst with FDR, those evangelicals found patriotic redemption in World War II. Unlike the First World War, where accusations of disloyalty were numerous against conservative Christians, the Second World War saw fundamentalists become the voices of American pride. World events represented the rising tide of evil and the impending tribulation: (1) Italian Fascist Benito Mussolini seemed poise to restore the Roman Empire, (2) Right-wing fascist dictator Adolf Hitler was driving the Jews out of Europe, (3) Joseph Stalin was instituting state atheism and left-wing communism, (4) America was in economic collapse, (5) and FDR’s totalitarian solution seemed like an assault on human freedom. All of these elements seemed to unite patriotism with faith, simultaneously justifying a war that pitted the cause of Christ against the forces of the AntiChrist. For ‘second coming’ evangelicals, the cause of freedom was the cause of Jesus. 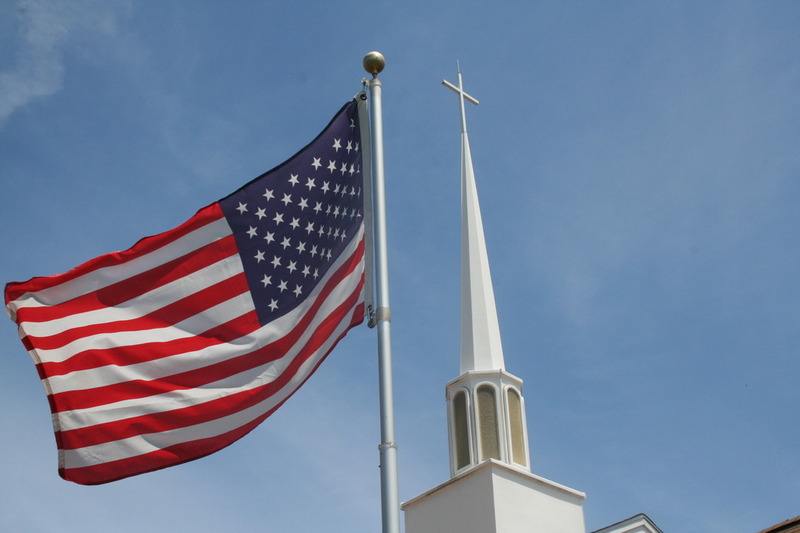 The voice of patriotism belonged to Bible-believing Christians. Subsequently, premillennialist devotion to prophecy and American Zionism increased exponentially with the restoration of Israeli statehood in 1948. Premillennialism seemed to be a self-fulfilling prophecy: (A) When events were fulfilled, the end was near. (B) When events weren’t fulfilled and the world seemed worse, the end was near. For the Bible-believing American, the imminent doom of the country did not discourage ardent patriotism. Today the word ‘millennial’ is no longer a primarily theological word. It’s a cultural word. It’s reserved for a younger generation of Americans that have grown up around the millennium. Not the one that begins after the tribulation. The one that began on January 1, 2000. And none of these young people grew up in a World War. Most of them can’t fathom a Great Depression. They’ve never wept at the news of a presidential assassination. For most evangelicals today, the mention of Barack Obama evokes more anger than it does nationalistic pride. The American home they’ve known is filled with systematic abortion, homosexual marriage, and GOP presidential candidates who can’t so much as remember a Bible verse. And perhaps this is why Christianity is so divided when it comes to patriotism. It’s a generational gap. A big one. It’s the reason why many evangelicals feel uncomfortable when the American flag is brought into a sanctuary. For a younger generation, patriotism and faith are two completely different spheres and shouldn’t be mixed. I tend to agree. But for an older generation, a generation who remembers the fight against global evil, that separation isn’t as easy. For younger Christians, they should remember something the next time they hear a World War II veteran talking about ‘A Christian nation.’ Believe it or not, there was a time when the American cause and the cause of Christ weren’t as far apart. And for that older patriotic Christian, they should also remember something. Nostalgia is tricky. It fools us into thinking that there was a time when America wasn’t divided. It makes us think that there was a time when our country wasn’t in turmoil. But that’s a lie. The ‘good ole days’ were never as ‘good’ as we paint them to be. As long as there’s been a Bible there have been people who oppose it. Young or old, a Christian should never expect Uncle Sam to reflect the Gospel. Faith and Patriotism are not one. They never were. And in Christ, they never will be. Please pray for our country. But before you do, pray for His Kingdom come. It’s not as ‘American’ as you might think.